Also known as centalla asiatica, spade leaf, Indian pennywort or brahmi, this herb is native to low-lying wetlands in Asia and Australia. 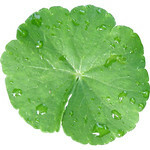 Extracts of gotu kola has been found to promote new cell growth, build collagen, improve blood circulation, speed up wound healing and reduce inflammation. Research has shown that gotu kola is more readily absorbed into the skin and used effectively to heal the skin when compared to other herbs. Cooling gel that helps reduce puffiness, dark circles and wrinkles around the eyes.